I’m gaga for goat cheese. When I saw a little sign at Berkeley’s Cheese Board Collective announcing a goat cheese class, I was all over it. 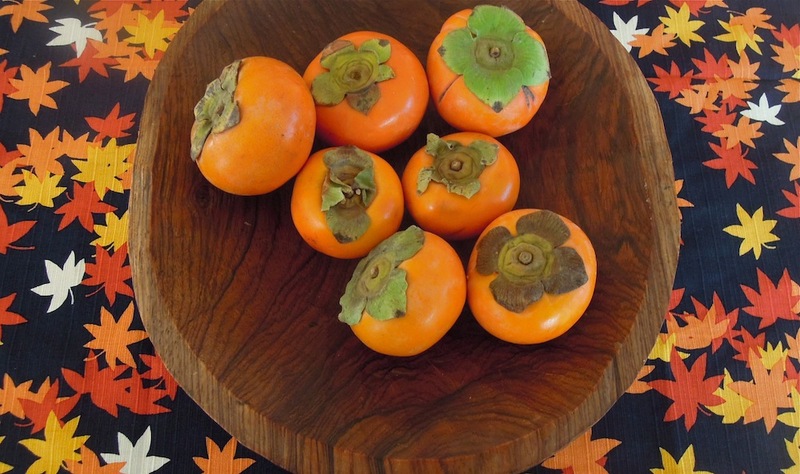 On a recent evening, two dozen eager, cheese-maker-wannabes were welcomed by platters laden with dates, pears, persimmons and several varieties of goat cheese to get us in the mood. The Bonne Bouche, with its squiggly gray, ash-ripened crust and pungent creamy interior disappeared quickly among this herd of goat cheese lovers. Then we met our instructor, the lovely Louella Hill, better known as the SF Milkmaid, who, in her old fashioned milk maid cap looked like she just stepped out of an illustration from a 19th century book of nursery rhymes. Then, on to the basics of her simple, but versatile recipe that is suited to making soft, fresh chevre or a complex, molded cheese. The fresh chevre we would go home with could be eaten in a day or so, or left to age with a pinch of added mold spores (geotrichium candidum) to turn it into a distant cousin of the Bonne Bouche. Scooping the curds from the whey. With an animal lover’s tender gaze, Hill confided that cheese is better from a sheep, cow or goat with whom you have a personal relationship. But if you don’t happen to have your own goats and hillside, she recommends buying Summerhill Dairy Goat milk. And the only other ingredients needed are cultured buttermilk, and a drop each of calcium chloride and rennet (both available at the Cheese Board). That led us into a serving of science, (including: coagulation, effects of homogenization, temperature, fat globules…etc.) but Hill’s explanations made these technical aspects easy to digest. She showed us a simple method to mix everything in the goat milk bottle, but instructed us to combine by gently tilting the bottle back and forth several times, instead of shaking. In order to help solids clump together and get rid of excess water, the milk mixture needs to rest quietly for about 12 hours (and not near a radio with a booming base, Hill cautioned). As an alternative to using a plastic cheese mold, with holes for the whey to continue to drain out, Hill demonstrated the tradition of tying up the cheese in–what else–cheesecloth. She also showed us how to sprinkle already formed cheese rounds with ash or, for an added zing, wrap them in booze-soaked fig leaves. Louella Hill has a book coming out next May from Chronicle Books, called Kitchen Creamery, with 30 recipes for home cheesemaking. 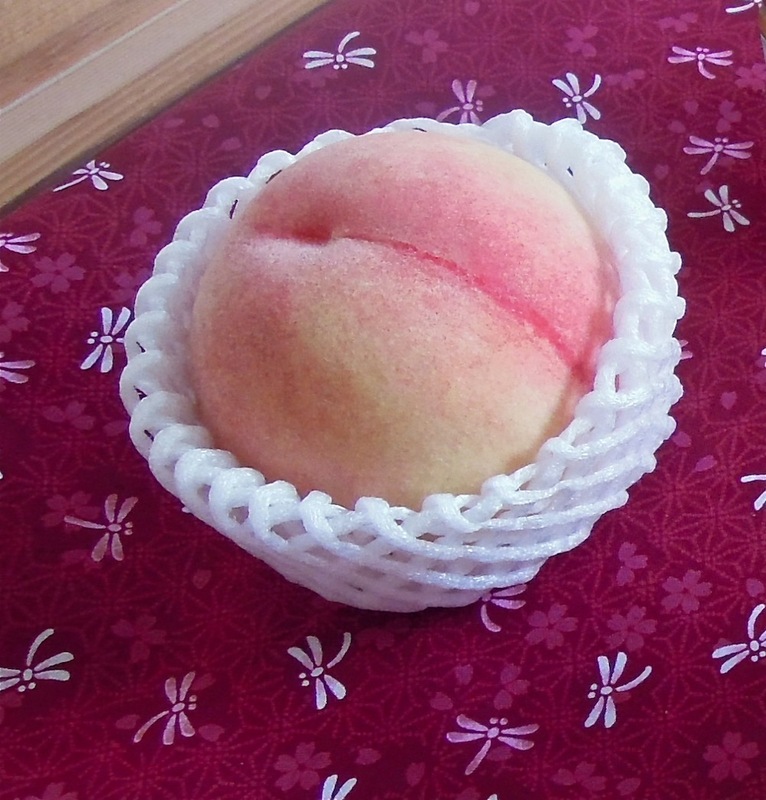 Lila has always appreciated my cute culinary creations. 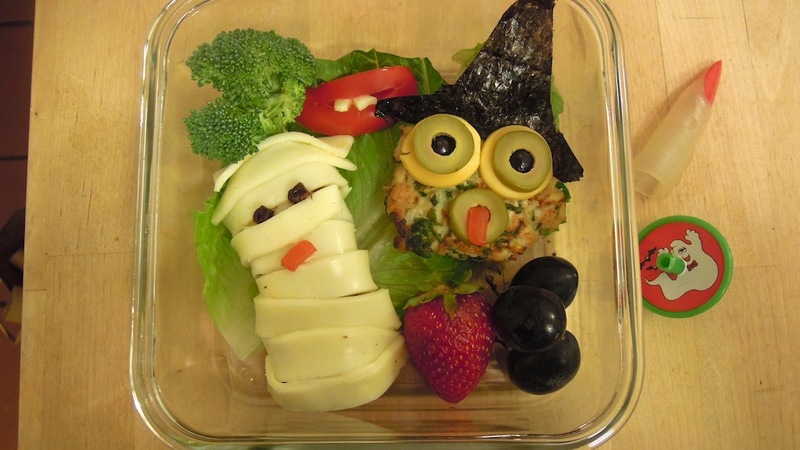 Now she’s away at college, but I still enjoy playing with food and I finally discovered the perfect antidote to candy mania: Halloween bento boxes — whimsical, packed lunches with healthy, attractive food that tempts your kids to taste new things and eat their veggies. 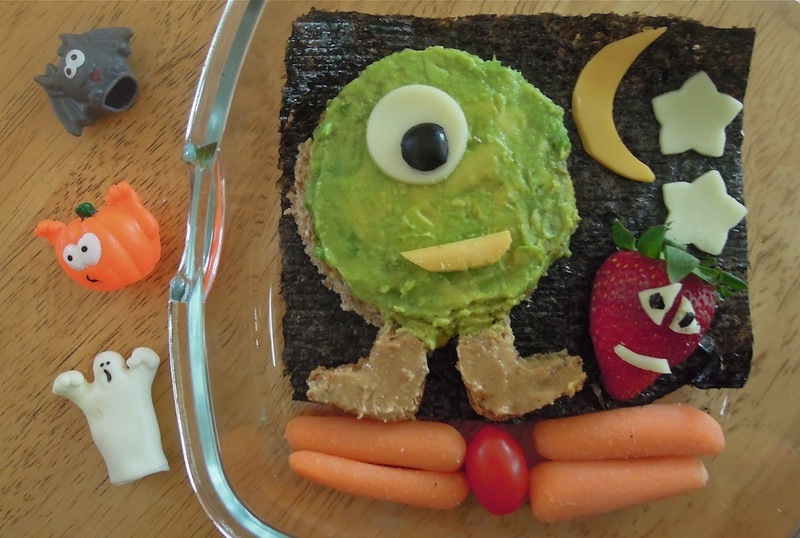 A typical mother spends almost an hour crafting every lunch into a healthful, beguiling blend of cartoon characters, flora and fauna — anything that will make the food appeal to her child. 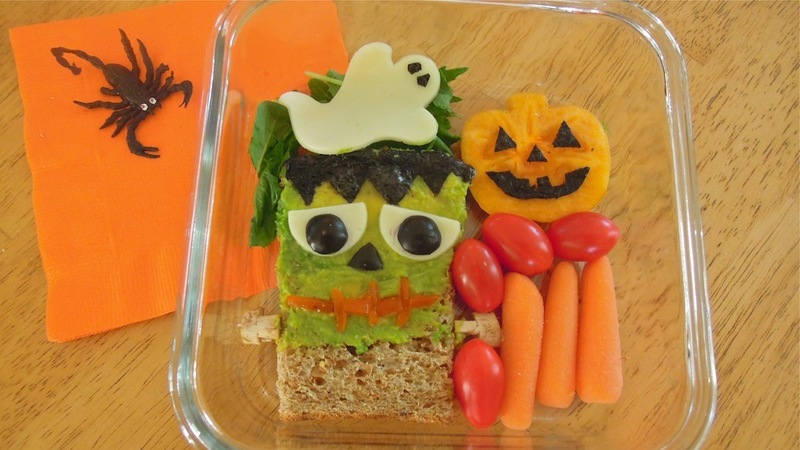 The teacher judges whether the lunch box is prepared according to obento rules (e.g., the food must be as handmade as possible, and it must be appetizing and aesthetically appealing to the child). 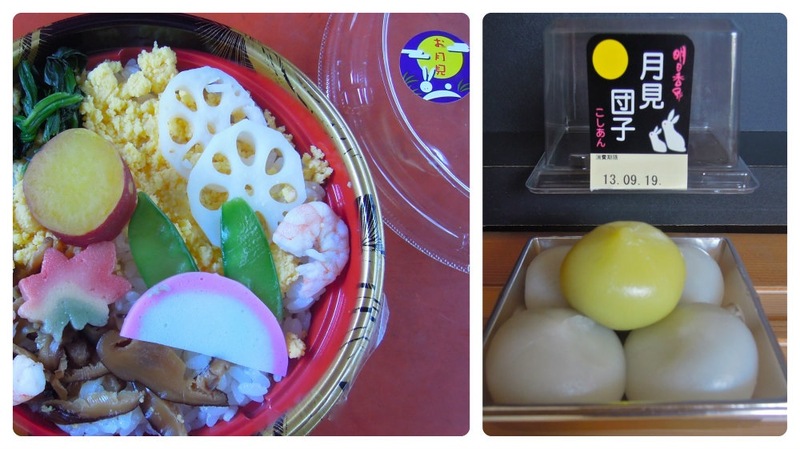 Bentos often highlight the season or a coming holiday. 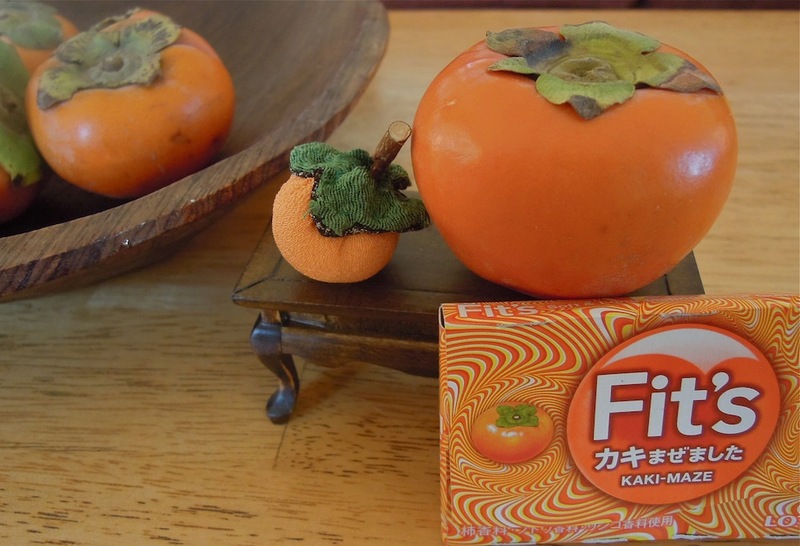 Although Halloween trick or treating is not practiced in Japan, the nation that is wild for cosplay loves to dress up and Halloween is sneaking into advertisements and decorations, thanks in part to Disneyland and Universal Studio theme parks in Japan. 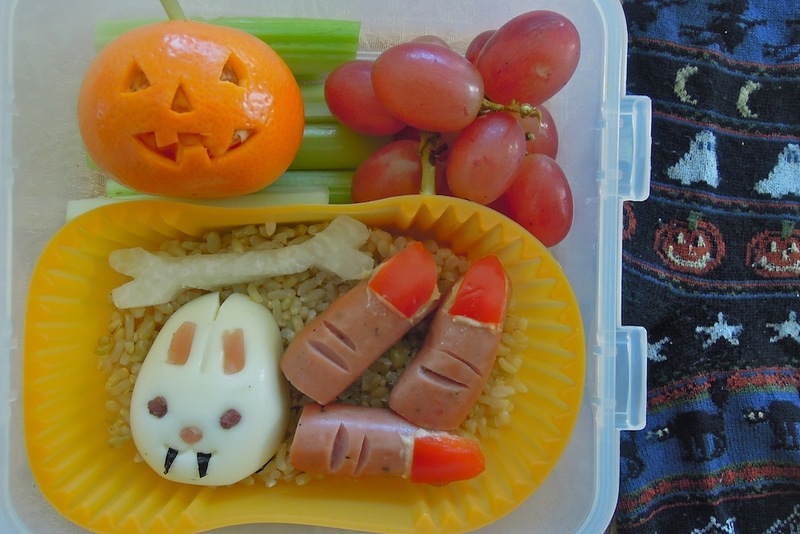 The practice of bento lunchbox making has now been adopted around the world. Bentos’ popularity is due, in part, to the fact that they encourage healthy, mindful eating and are environmentally friendly — since there is no extra packaging to throw away. Adults often appreciate the portion control in pre-made lunches for weight loss. And taking the time to prepare an attractive meal definitely is a sign of love, (even for yourself). Really, you don’t need any special tools or equipment, just a sharp knife and a little patience. That said, there is a ton of stuff out there either made specifically for bentos or available at your local art, hardware or dollar store. 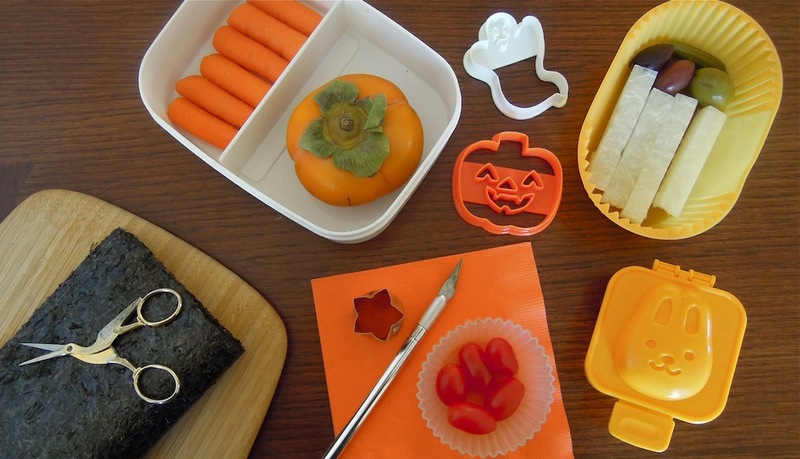 Optional helpers: cookie cutters, hard-boiled egg molds, rice molds, divided boxes, silicone containers, fancy toothpicks. Locally, a cheap place to buy bento-paraphernalia is the $1.50 store, Daiso. 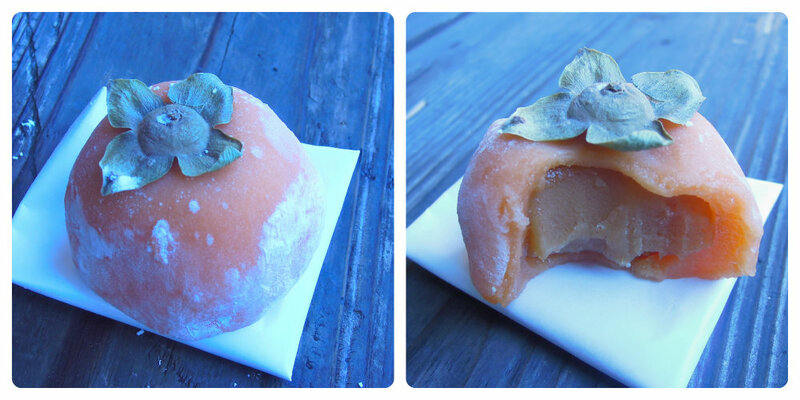 There’s one in Berkeley, one in SF Japantown and others in the larger Bay Area. A little more classy assortment can be found at Berkeley’s Tokyo Fish Market Gift Shop. If the Internet doesn’t provide enough inspiration, Amazon lists hundreds of books on the subject. 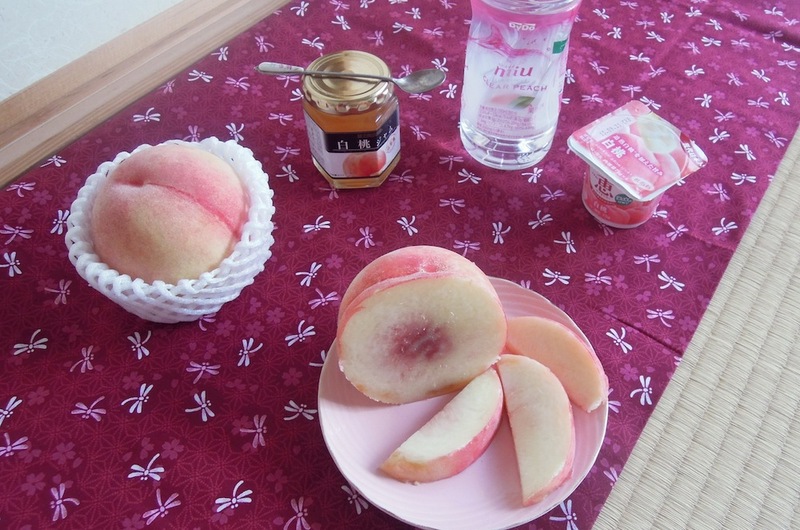 Number one on their list is The Just Bento Cookbook by Makiko Itoh, whose twin websites, Just Bento and Just Hungry, I visit often. They have deservingly won wide acclaim. 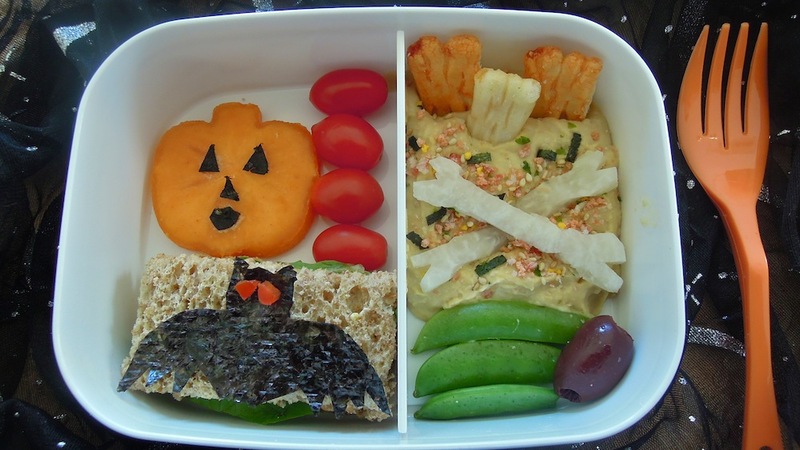 Here is a post on Halloween bentos by Makiko. 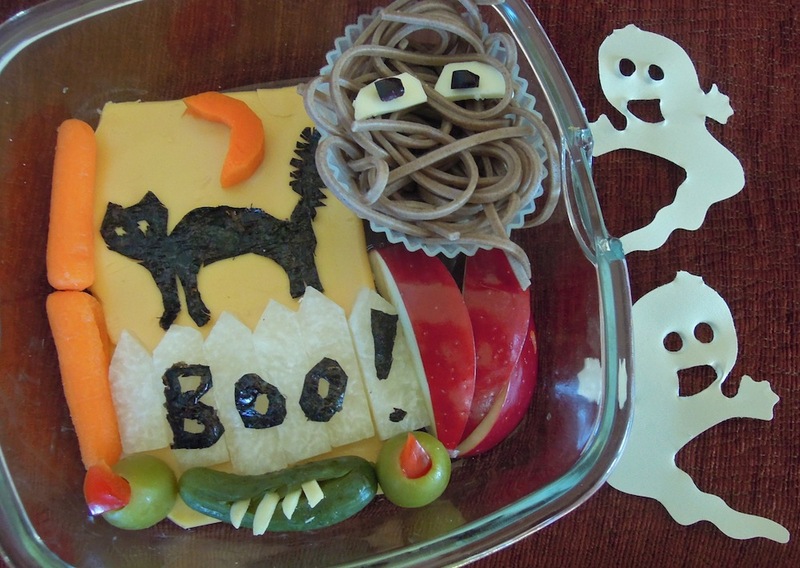 You don’t have to make special food items for bentos; left-overs often serve well, with a little decoration. The unwritten rule seems to be that each bento should contain a well-rounded meal with protein, carbs, fruit and veggies. 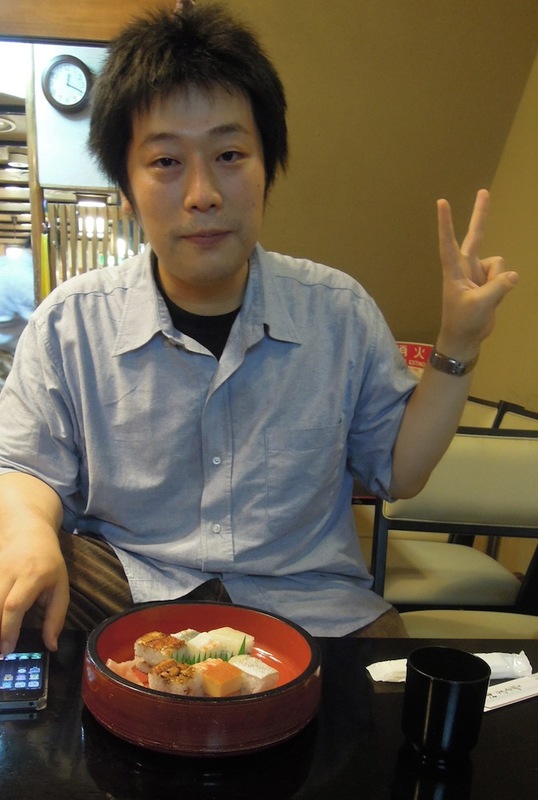 I found my way to his compact kitchen through the Kansai Volunteer Guides’ website, where Koichi, who wants to practice his English with foreign visitors, mentions his love of sushi and desire to share its history with travelers. I’ve had previous memorable experiences with Kyoto Free Guides and Tokyo Free Guides and the prospect of learning more about my favorite food–sushi–during my brief stay in Japan was irresistible. I didn’t realize this tour was going to be so hands-on. As we enjoyed our lunch of Osaka style hakozushi, which is formed by pressing rice and prepared fish in a wooden box, Koichi explained a little about the history of sushi, which spans hundreds of years in Southeast Asia and Japan, and was originally a technique of preserving rice and fish by fermentation. 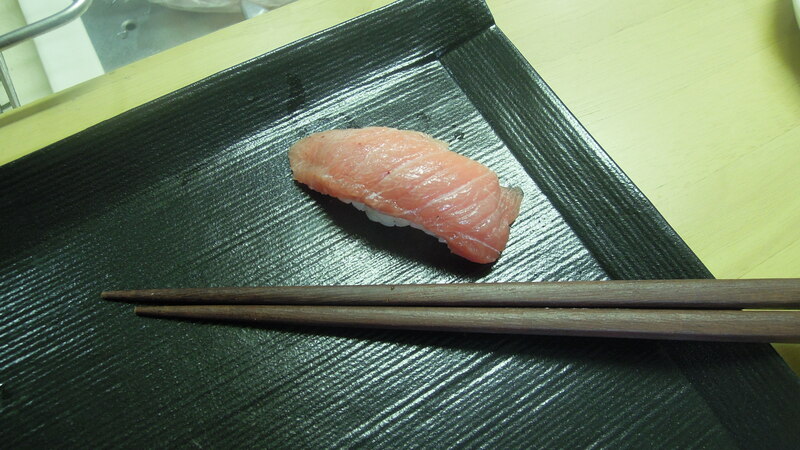 The nigiri sushi using raw fish that we are most familiar with (known as Edo or Tokyo style) is a relative newcomer, only about 150 years old. 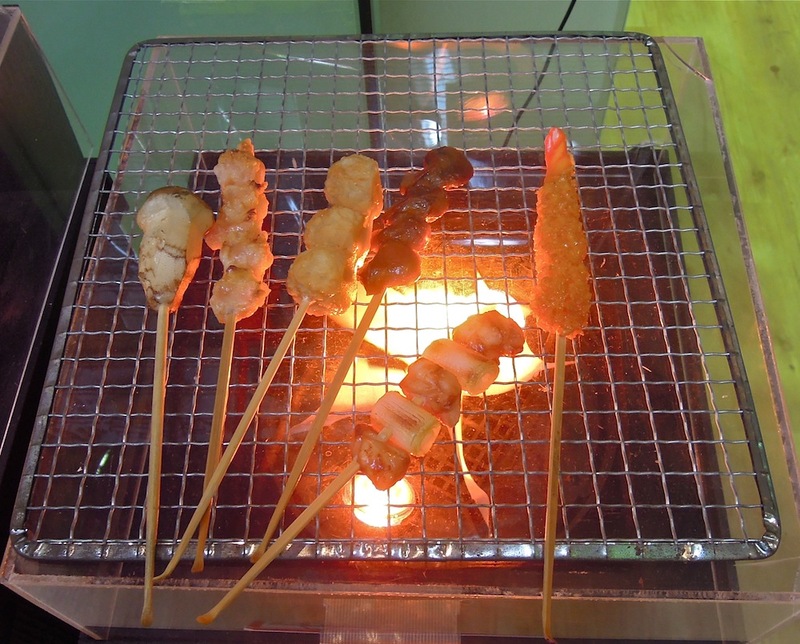 Without refrigeration, raw fish could not be eaten, unless it was dockside. So all the fish featured in our Osaka style lunch was cooked or cured in vinegar. After pressing in the wooden box, the resulting large block of sushi is cut into bite-sized pieces, each with two or more varieties such as shrimp, tamago, hirame and eel. Another Osaka specialty we sampled: large rectangles of pressed and sliced mackerel wearing a delicate kombu veil. 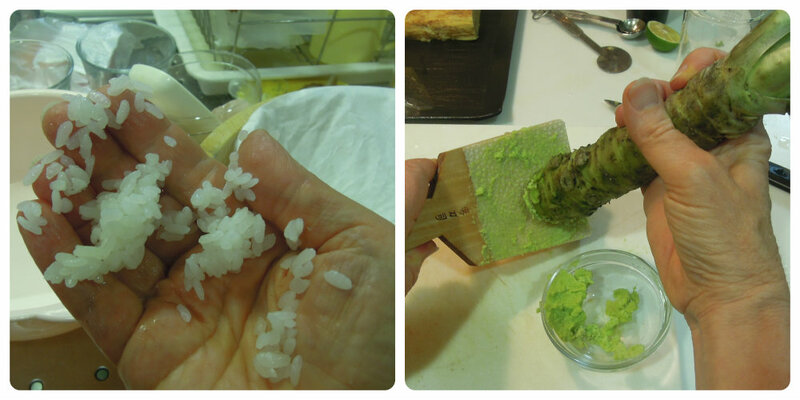 No wasabi was in sight and Koichi said our sushi didn’t really need soy sauce. He disapproved of the thick sludge of wasabi and soy sauce I told him most Americans stir up to slather their sushi. After a detour through a “chefs’ street,” perusing shops selling every incarnation of plastic display food and ogling gleaming professional knives costing several thousand dollars, we ended up shopping for the freshest fish at — of all places — Takashimaya department store basement. Actually Japanese department store food basements are a wonderland of every possible delicacy, attractively displayed – often with sample tastes – easy dining for non-Japanese speakers – all you have to do is point. 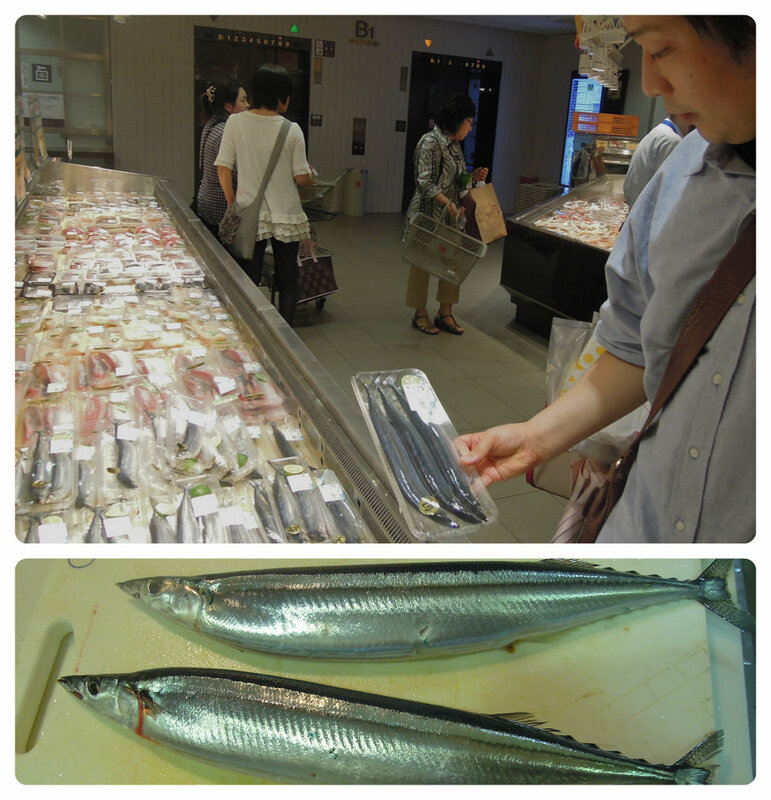 Koichi was thrilled to find some beautiful sanma (pacific saury), a harbinger of autumn. He could tell it was very fresh from its gleaming silvery blue skin, transparent eye, and moist tail. 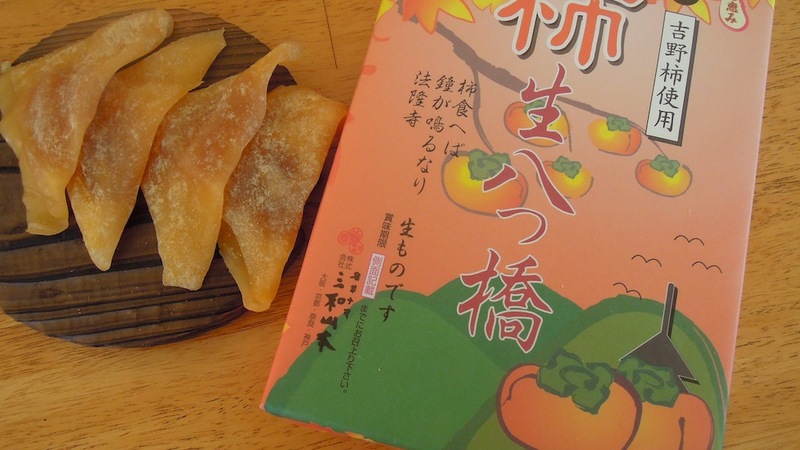 He put a pair in his basket along with, anago (sea eel), tai (sea bream), tuna, aji (horse mackerel) and several other ingredients. At his condo, I met Koichi’s wife and baby daughter and Koichi demonstrated the many rituals of the sushi preparation while I watched attentively from a ringside seat. Throughout his measuring, mixing, boiling, steaming and slicing, Koichi thoughtfully shared his recipes and provided me with a steady stream of tastes. 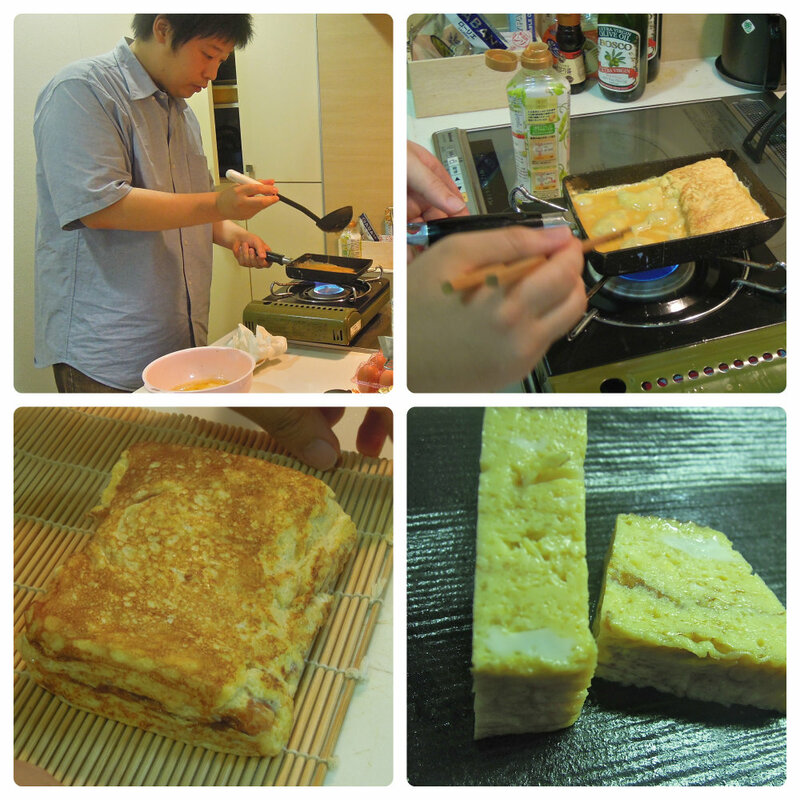 First challenge: tamago, the egg omelet. 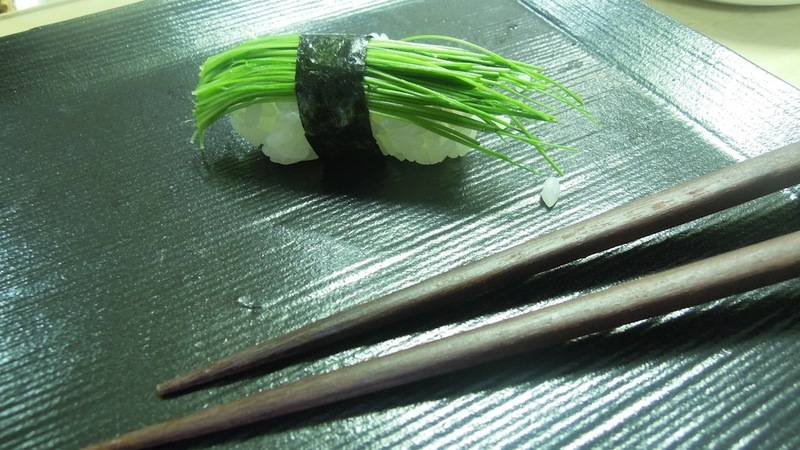 This seemingly simple inclusion in many set sushi menus back home is actually extremely difficult to make. As he poured, folded and refolded the mixture of egg, mirin, sugar and soy sauce in a series of moves in a special pan, Koichi confessed that his success rate is only about 50%. Today was a lucky day and he nailed it. 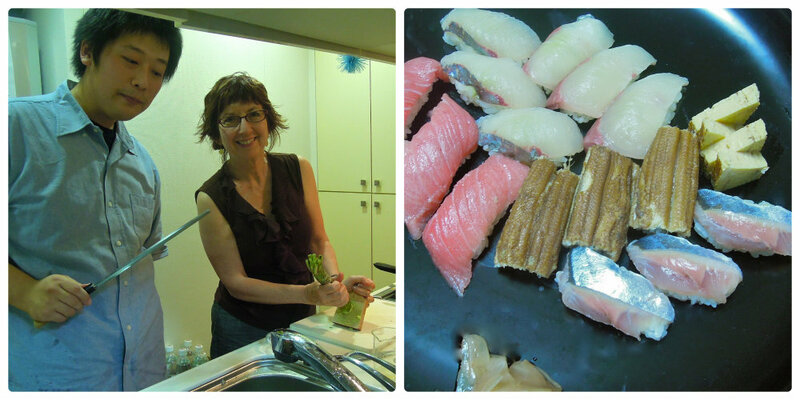 Then the eel had to be boiled, the tai skin seared, and the sanma gutted and deboned and the other fish thinly sliced. Koichi offered me a knife but I’m a little squeamish with blood and guts and, considering he works as a neurosurgeon, I figured that sharp metal objects would be better off in his seasoned hands. After the buttery tuna, he served me a new taste: scallion sprouts, a delightful, palate cleanser. 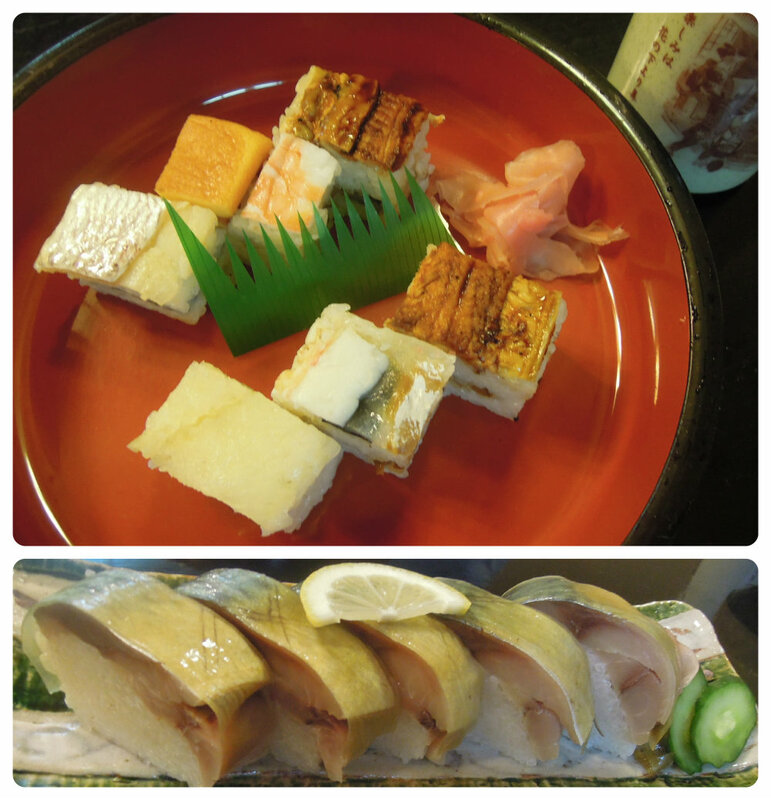 As we enjoyed our dinner, I mentioned that my favorite sushi is mirugai (giant clam). Koichi was impressed (and I was glad to be familiar with more than just California rolls). As we said our goodbyes, Koichi presented me with a book on sushi in both Japanese and English for a “fellow sushi maniac.” I can’t imagine a more thoughtful gift to end a day that was totemo oishii (totally delicious). Jimmy Zhang’s passion was unleashed by a potato. As a teenager in Shenyang, China, he saw a video of a chef carving a rose out of a potato and was instantly hooked. But when he tried to fashion his own spud blossoms at home with an ordinary knife, he discovered it wasn’t as easy as it looked. So after high school, Zhang enrolled in a Chinese Culinary Arts Institute program specializing in the ancient art of fruit and vegetable carving. After assisting his distinguished teacher, winning international competitions in China and abroad, he moved to Northern California. He now teaches locally and nationally, presents live demonstrations and carves elaborate creations for events from birthday banquets to weddings. 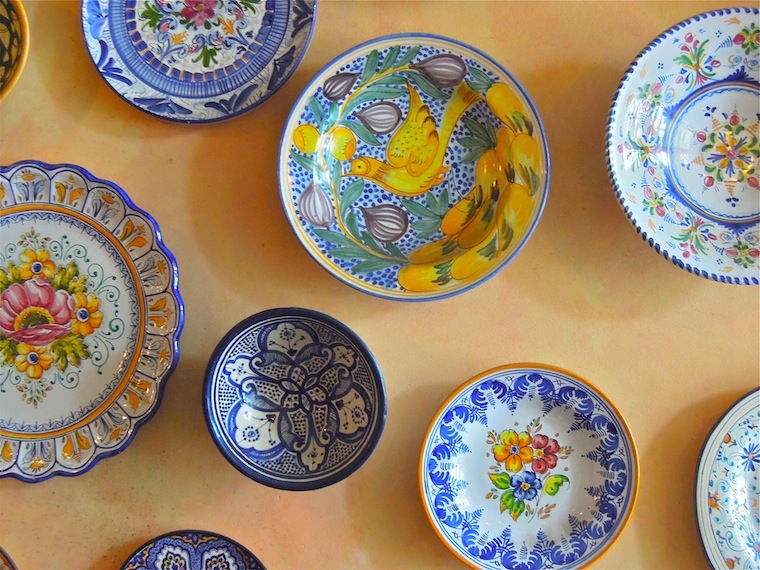 “My dream was to travel and see the world outside of China,” says Zhang. A visit to a friend in sunny California, decided his future, but in 1997, when Zhang moved here, he spoke no English. He took ESL classes–where he met his future wife–but didn’t think his English improved much. Zhang’s favorite subjects are living creatures, since the challenge is to depict their vitality through action or emotion. He has carved rearing horses out of taro, tropical fish from squash and carrots and a feisty dragon out of giant radishes. A crew from Snapple once came to his house and filmed him carving an entire vegetable tableau to illustrate one of the facts on their lids: “A dolphin sleeps with one eye open.” Zhang fashioned a beach scene, complete with taro dolphin lounging on a beach chair underneath an acorn squash umbrella, the dolphin’s one open eye is focused possessively on his bottle of Snapple. 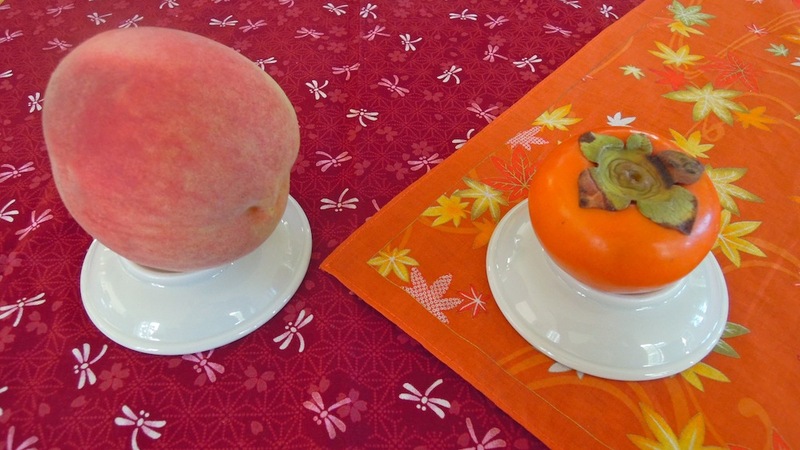 Zhang, a recipient of numerous medals at professional fruit carving competitions, is in high demand as a teacher and is often invited to present daylong to weeklong courses at culinary schools around the country. 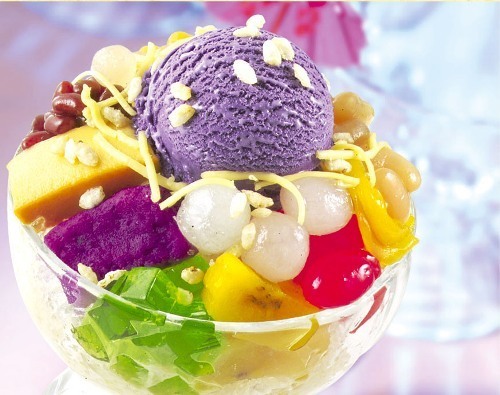 He also organizes his own private group classes through his website, Art Chef. Future plans include a summer program designed specifically for youth, ages 13-20. “Mostly, I’ve taught adults, both professionals and non-professionals, but young people really love this art too and it’s good to develop your skills at an early age, since it takes some practice,” says Zhang, who began learning his craft at age 19. 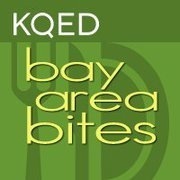 A version of this piece was first posted on KQED Bay Area Bites. A big thanks to filmmaker Kim Aronson for collaborating with me.